The Nikon F4 Single Lens Reflex (SLR) camera was introduced by Nikon in 1988. I bought two F4’s in 1992 with a range of lenses from 20mm up to 300mm. This outfit served me well and travelled with me around the world, and many other places!! I don’t think I will part with them as we’ve shared too many enjoyable experiences together. For most of the time they are packed away and only until recently did I remember to get them out, load the batteries, and make sure they were still in good working order. My son had asked if he could borrow one and a couple of lenses to shoot and experiment with a roll of film, and of course I agreed. On a recent visit he bought the film, loaded it up, and then asked how does one of these old fangled cameras work? A Nikon F4 does look a little complicated but I assured him it is no more complicated than a Digital SLR of today’s generation, which in itself can involve a serious learning curve. 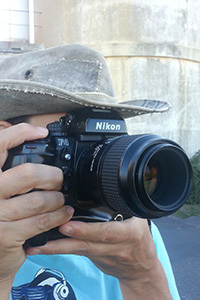 The F4 was the first professional Nikon to offer autofocus; at the time it was innovative in the specifications it offered, which today are accepted as being normal. The exposure selection offers full aperture and shutter speed auto combination, aperture priority, shutter speed priority and manual. It was during the course of explaining this to my new student that I realized just how much these cameras had become a part of me. My memory was a little rusty trying to find the right way to explain the workings and the combinations possible, but my gestures and how I held and operated these cameras were almost automated in themselves – my fingers had already set the controls on the camera and then it took me a few seconds to find the correct way to explain why I had arrived at those settings. I had decided to take a record of our outing with my Samsung Galaxy SIII smart phone. I had downloaded the app ‘ProCapture – camera + panorama’ – some time ago and the quality is exceptional. It never fails to surprise me the images that can be created with camera smart phones and I am sure that will continue to be the case. My love of photography, the photographic process, and the way images can be created is limitless, and I will be sharing more of my ideas about this in the future. My son soon shot off 24 exposures of various subjects, including his wife as reluctant model. As he finished the last shot his wife asked to see the results, but then quickly realised that we all had to wait for the film to be processed and printed or burned to CD before results could be seen!! !